New Leaf is expanding to offer flights from Canada to U.S. destinations and one of their first routes is Hamilton to Melbourne, Florida. New Leaf is trying to pass it off as 'Orlando - Melbourne, Florida' but that's a bit of a stretch. 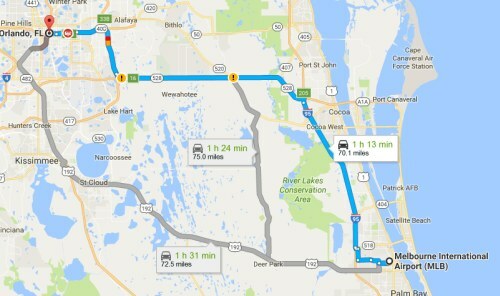 Melbourne is about a 70 minute drive from Orlando. New Leaf is offering some cheaper prices on the introductory flights in January 2017. The flights from February to April 2017 are priced quite a bit higher. New Leaf will likely discount these at some point. 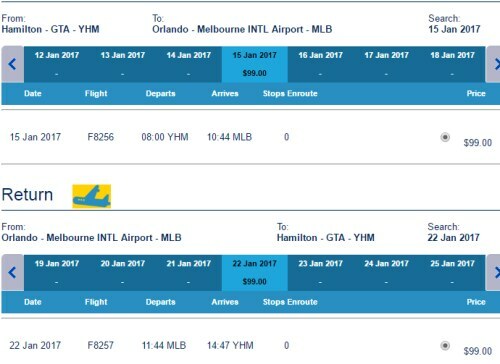 Update 11/21 - New Leaf has now dropped the price of their February to April 2017 flights from Hamilton to Melbourne, Florida down to $198 CAD roundtrip including taxes. Feb 5, 12, 19, 26 -- new! Mar 5, 19, 26 -- new! Apr 2, 19, 16, 23, 30 -- new! Mar 5, 12, 26 -- new! Apr 2, 9, 16, 23, 30 -- new! flight deals, united states, florida, north america, hamilton, yhm, melbourne, new leaf and mlb.